Devoted daughter, sister, mother, wife, writer, teacher, friend, dog lover, self-proclaimed homebody and nester, tender of gardens and baby goats, Jill McCorkle (b. 1958), juggler extraordinaire, has long distinguished herself as an empathetic chronicler of ordinary people with complicated, unsung lives. 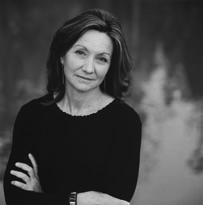 A 1980 graduate of the University of North Carolina at Chapel Hill with Highest Honors in Creative Writing, she was mentored by distinguished faculty that included Louis D. Rubin Jr., founder of Algonquin Books, Max Steele, Doris Betts, and Lee Smith. She went on to complete her Masters in Writing from Hollins College in 1981. Many awards followed, including the New England Booksellers Award, the John Dos Passos Prize for Excellence in Literature, and the North Carolina Award for Literature. Five of her books have been selected as New York Times “Notables,” and her prize-winning short stories and essays have appeared in an array of magazines and journals, including Oxford American, Cosmopolitan, Southern Review, Garden & Gun, and The Atlantic Monthly. Courtesy of the Sewanee Writers Conference. Courtesy of the NC Writers’ Network. Courtesy of the Orange County Literacy Council.